Home › Nutrition and Diet › Dr. Lisa’s Top Ten Snack Foods For A Skinnier, Healthier You! Dr. Lisa’s Top Ten Snack Foods For A Skinnier, Healthier You! Dr. Lisa’s Top 10 Snack Foods For A Skinnier, Healthier You! Whether you are trying to eat better to improve your general health or because you want to look fabulous in Athleta clothes this summer, a little planning around your snacks will help you achieve your goals. Don’t wait until the munchies hit to find some snack food…stock up and be prepared. You’ll be glad you did. 1. Frozen grapes. This one couldn’t be easier and is my personal favorite for taming the late night munchies. May I suggest the plump, turgid, red, seedless variety? Give ’em a rinse and let them dry a bit. Pop them into the freezer. I put them in an open bowl. When you start craving something sweet, take out a bunch and enjoy your tiny purple Popsicles! 2. Baby carrots. Did you know that if you eat enough carrots and other produce packed with beta carotene, you can develop an orange hue to your skin? Short of that, there’s no limit to how often you can turn to carrots for a delicious, nutritious snack. Don’t like them plain? Dip them in some hummus. 3. Hummus. Yes, yes, I got myself thinking about hummus after contemplating baby carrots. What’s better than a plate of raw veggies and a little hummus for dipping? Various colored peppers, celery, radishes, sugar snap peas, broccoli…dip a rainbow of veggies in your hummus. I spend 15 minutes washing & chopping veggies on Sundays. Then I pack them back up in the fridge & they’re ready to eat whenever I need a snack. 4. Nuts! Two words of warning with nuts. The first is portion control. I buy little snack sized baggies and carefully measure about 1/4 cup of nuts into each. That way I won’t inadvertently over-indulge. The other consideration is the safety of those around you. Today’s youth are challenged with a high prevalence of nut allergies. Be a friend and wash your hands after eating nuts. You never know who is going to touch the door knob, elevator button, railing or park bench after you. 5. Popcorn. If you’re really craving something that feels like junk food, give popcorn a try. Avoid butter and salt. Popcorn is tasty on its own, once you get used to the unadorned version. Watch out if you’re eating in front of the TV. Mindless eating leads to overeating, so measure out a reasonable portion before you start chomping. 6. Apples! They weren’t kidding when they said, “an apple a day keeps the doctor away!” What an easy, healthy option. You should eat one daily. Be sure to wash your apple well to avoid chemicals ingestion. Apples are a great option when you’re on the go. 7. Edamame. I love how mainstream edamame has become. The days of searching for an Asian grocery store in order to find edamame are gone. 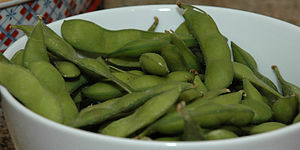 Most grocery store chains seem to carry frozen edamame, both in and out of the shell. No need to add salt or anything else to these healthy green protein machines. Just pop a bowl of frozen edamame with a little water into your microwave (usually about 2 minutes for a small bowl, 3 or 4 if larger), drain and eat. They taste good warm, at room temperature or cold, making edamame another good snack to bring along when you’re out and about. 8. Berries. Blueberries truly are a superfood! Try them fresh or frozen. They’re packed with anti-oxidants and nutrients which can reduce inflammation, keep your mind sharp and potentially impact some of the effects of aging. Just be sure to brush your teeth after eating! 9. Cheerios. Yep, toddlers and adults alike can make a snack out of Os. This isn’t my favorite option, I advocate fruits and veggies as the ideals snacks, but I often keep a box in my car as a back up for those times when produce isn’t available and I don’t want to resort to buying junk food. 10. Pears. I know, they’re a bit fragile to throw into your bag while you’re heading to work or running errands. Eat them at home, with an ample supply of napkins, as they’re dripping with naturally sweet juice. Pears are packed with fiber which will keep you full longer for fewer calories. According to the Mayo Clinic, one medium pear contains as much fiber as a serving of bran flakes!